Gamification is the prominent E-Learning trend in 2016. Not only 2016, it is one of the ELearning trends to watch in next 5 years according to Karl M. Kapp. Why it is so hot trending topic now? 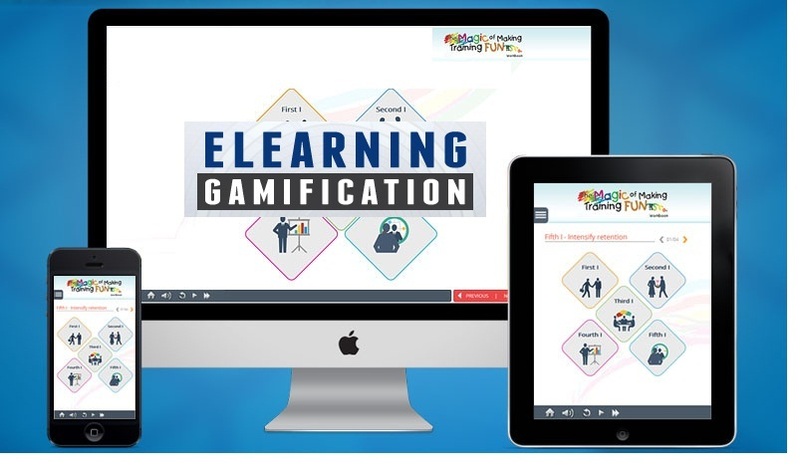 The effect of gamification on e-Learning is amazing and it brings out powerful results. When applying ‘game mechanics’ in the learning environment, learners are being motivated and engaged well. Retention and application skills are much better in gaming environment. For these amazing hits, we tend to Gamify in the eLearning programs. Gamification in ELearning - What does it mean? Gamification is integrating game mechanics with specific learning outcomes. It can be said as “Play, Learn and Grow”. It involves sound instructional design to provide a balance between specific learning objective that needs to be learned, playing games and tendency of applying knowledge and skills in the real world. What are some of the gamification mechanics/elements and how can we integrate them to eLearning? Let us look some ideas to tryout. It is a key part of many games. It is incorporated with story telling, characters, sequence of events. Rules are a critical part of any game to set parameters. These are what learners can and cannot do in the game play. Use specific and concise instructions for the learners to understand and communicate with the scenario. Game encourages discovery and finding hidden treasures. And also people love to hunt a treasure. Boost up the game by including hidden nuggets of additional information as fun and to hunt extra points. Be sure, essential information that learner need to know are not in the part of hunting nuggets. A game without learner interaction, then it’s not a game. Games are interactive, stimulus and joyful. Think and make your content as more interactive. Instead of select or click options, design powerful interactions that induce learner’s application skills and decision making capability. Immediate feedback for the learner’s action is a kind of motivation and serves as an encouragement factor for the learner’s journey. Just showing text feedback is not effective. You may provide badges, unlocking new features, and mystery boxes to show feedback. Timer supports to make a game more realistic and forces user to act quickly. Instruct the learner to do the activity within the given time limits. In game play, people like to achieve more rewards and bonus points. Offer bonus points, score boosters, based on the user choices or difficulty of the questions. Levels and challenges are common element in Game mechanics. Design your course into levels/grades and unlock each level based on user’s correct answers or points earned. Well, now let us conclude. In order to effectively integrate gamification to your courses, the game elements need to be analyzed and designed soundly. Coursera is an education platform that partners with top universities and organizations worldwide, to offer courses online for anyone to take. White House Business Solution Pvt Ltd., is one of the coursera course developers for an international organization for the past 4 years. WHBS adopts gamification techniques, design and develop effective game based eLearning courses based on the customer needs. "I sincerely extend many many thanks for your help on the various projects related to the World Bank's eInstitute launch. It was a huge success and I would like to acknoweldge your efforts in making this happen. And, we have many more miles to go together. Thank you so much...."
"I have worked closely with the Multimedia team of WHBS to manage several projects over a period of seven years and I have always found them working hard to achieve the best result.They have reliably kept to the production schedule. They have successfully realized my ideas and I am proud of what we have achieved together. I wish White House Business Solutions a great success in all their future business ventures." "We are extremely happy with the kind of service and attention WHBS offers.Their expertise, creativity and hands on approach to the content development are next to none. Their team is incredible professional and responsive in answering our queries and providing timely support." White House Business Solution is a leading edge learning and training technology provider to Corporations, Universities, Schools, Educational publishers and Government Institutions. Since year 2000, WHBS 's unified framework and the products built around it has powered some of the world's best digital learning, assessment & talent management programs. We have a team of over 200 full time associates based in India with a global clientele. Our solutions also include m-learning products, custom course-ware development, multi platform content authoring tool & services around popular open source systems. Working relationship with companies across the globe. Over 30+ active client engagements; 1millions man hours of experience in developing e-content. Ranked Top service providers with over a decade’s experience in International markets; Zero defect tolerance policy. Started in 1999, and located at the heart of the city, WHBS has its own infrastructure, with an employee base of 150+. Our reputed clientele list will show how far we've been soughted, trusted and delivered for various sectors in various domains. Extending support to the domain experts by partnering with them, we proposed successful business models to establish their products worldwide and to create their brand identity. With new tools, standards, compliances cropping up day by day due to technological advancements, WHBS offers one stop solution for all your needs in e-learning industry. Copyright - whbs@2019 - Whitehouseit. All Rights Reserved.. Travel theme. Powered by Blogger.